Business leaders are increasing pressure to dramatically reduce council numbers in Tasmania following a damning poll. The Tasmanian Chamber of Commerce and Industry has long advocated the need to cull the number of councils, last year revealing a bold plan to downsize councils from 29 to three. The suggestion attracted strong support from business and domestic ratepayers with opposition from government and Local Government. But, politicians may now be swayed by public opinion with more than three quarters of Tasmanians (76 per cent) believing there are too many councils in the state, according to a poll by the Mercury newspaper. The poll also showed that 83 per cent of Tasmanians supported merging with 29 local government areas deemed unacceptable. And voter support for cutting councils and merging has increased since previous polls which encouraged the Government to introduce a voluntary amalgamation process – a move that has since failed. Some councils have agreed to merger discussions but have been stymied by neighbouring councils who don’t want to change. TCCI CEO Michael Bailey said it was time to rattle the cage. “Following the Mercury poll, we are taking a front foot approach to introduce community forums around the state and listen to the discourse of the community,” Mr Bailey said. Mr Bailey said the need for change was too strong from all angles not to continue pressing the State Government regardless of the promise before last year’s election that there would be no forced mergers for the term of this government. “Sometimes governments have to bite the bullet and listen to the huge community support and change direction,” he said. “I find it hard to understand that if 83 percent of the state want mergers then surely it couldn’t be looked on as a broken promise. Mr Bailey said it was a ridiculous system of over government – with duplication of services costing the community and business tens, if not hundreds of millions of dollars. Tasmania has 29 councils and 263 councilors, for a population of just over 500,000 people, ranging in size from under 1000 people on Flinders Island to more than 67,000 people in Launceston. While councils in the north, south and south east have opened up with nearby councils to reduce costs and add size and grunt to the new council, merging is yet to happen. 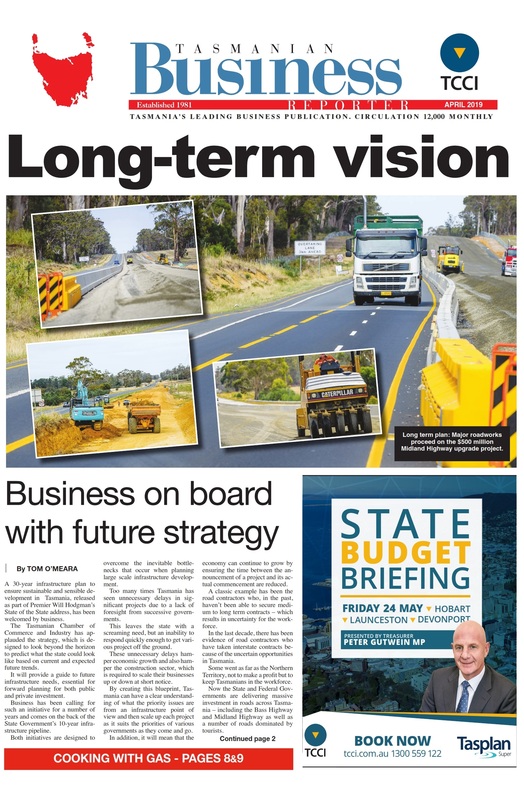 With the Tasmanian economy at its strongest in recent history, the TCCI said it would continue to push for the support of Government and Opposition to reform local government as a major priority.